If you're considering the replacement of your home's windows and pondering which type of operational window will best serve your needs, here are a few points that may help you make the right decision. Casement windows are the most popular, most typical operational window used in residential homes today. They open out sideways up to 90 degrees. 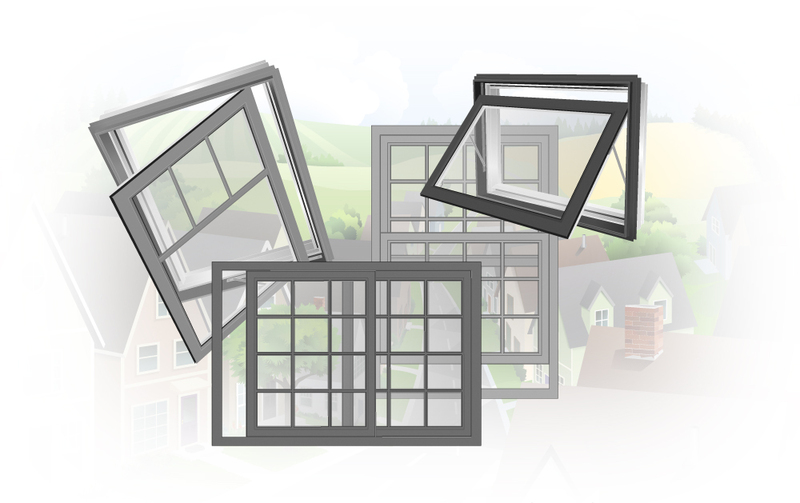 They are attractive, secure and tend to provide better energy efficiency than hung, slider and awning windows that are configured with standard glass and gas fills. These windows are almost always used at the front of a home. The screen is on the inside of the window and is easily removed from inside the home. Most secure operational window available. Hung windows are the most traditional window of all operational windows. In the past up until more recent history, they were the only operational window available and would appear on all sides of the home. They move vertically up and down. Sliding windows are very similar to hung windows, with the exception that they move horizontally rather than vertical. Slider windows are typically used in basements or the sides and back of the home. Awning windows have increased in popularity over the years, especially for homes of a more modern nature. they are great for bathrooms and areas that require a higher window placement. They open and lock from the bottom and when open, they create an almost roof like appearance. They also provide great ventilation and they are perfect for wet weather and moderate wind. Awning windows are often placed higher on a wall than other types of windows, and they are a great mix when a wall of windows is part of the home’s design.